In Auckland, late 1990s, I heard about this fabulously exotic bike ride across wild and unforgiving country called the Rainbow Rage. The ride traversed a far-flung and mountainous 106km from St Arnaud to Hanmer Springs. I thought it would be great to do it someday but it seemed so far away I filed the idea in the too hard basket. 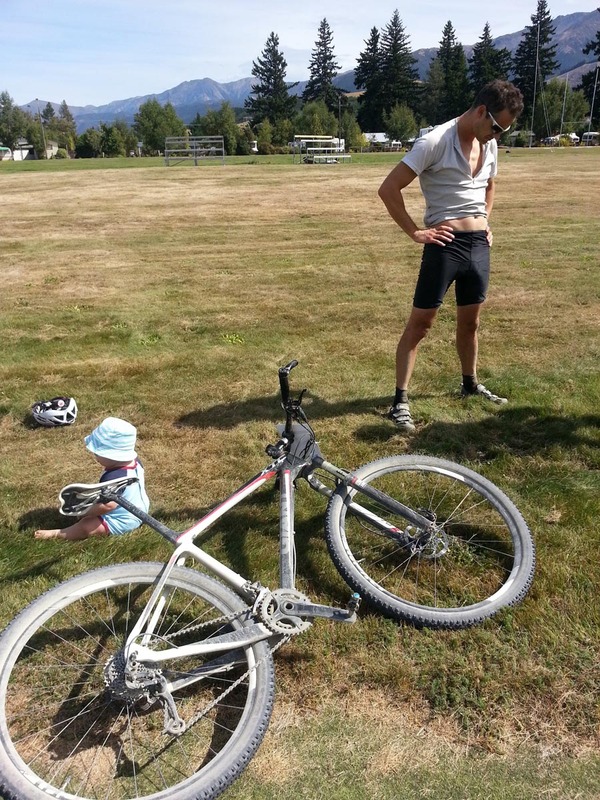 Well, a couple of months ago we relocated from the big smoke to Blenheim and although I hadn’t done much riding since becoming a dad, I thought I’d resurrect the 15 year old aspiration. Although drought gripped the countryside we kept a keen eye on the forecast in the preceding days as rain was predicted. Luckily it arrived a day after the event; the Saturday dawned typically fine. A 3:30am rise from bed was not exactly what the doctor ordered, but nonetheless I was rearing to go. At the starting area the riders were assembling and so was the apprehension in my stomach. 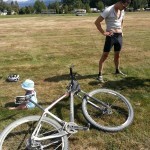 I had some pretty big concerns about my ability to ride over 100km across rough gravel. At 8:50am, with ten minutes to go, I realised I had the car keys; my wife would be stranded and unable to drive to Hanmer. I was yelling out around the paddock frantically trying to find her and fortunately did so with a few minutes to spare. Then I realised I hadn’t gone to the toilet and thus left my bike on the start line with 3 minutes to go and was unsuccessful in that mission. With 2 minutes to go I saw that the race number had almost fallen off. Not the ideal lead-in but so be it. Finally the horn sounded and we were off. I had heard about the ford crossings but was surprised to find one just 100m after the start. It wasn’t a problem though as the organiser was leading us through in the 4WD, and the pace was gentle as we rode on the initial few kms of sealed road. After 5 kms or so, the 4WD veered off and the pace picked up. Up ahead the distant peaks reared menacingly. We were on our own, and I couldn’t help thinking of Bilbo & co crossing the Misty Mountains. After 10 minutes or so, a leading bunch of maybe 25 riders had separated themselves from the field. With the undulating seal about to finish, I made sure I was near the front of the group. There were also three riders pushing the pace with ‘Village Cycles’ shirts who seemed to know each other so I guessed they would work together. Suddenly the dusty gravel was upon us and after a few sharpish downhill bends the group hit a ford; maybe the 4th or 5th so far, and certainly the deepest. The water sprayed amongst the flashes from the surrounding photographers, and I was aware of some riders around me stopping as it deepened. I just managed to stay on and was immediately confronted by a sharp climb, which made keeping momentum through the water all the more important. Up the ascent I suspected the field had now whittled away somewhat. The road flattened out before too long and the leading group was now considerably smaller; there were just 7 in the bunch (which included the ‘Village Cycles’ blokes). The seven of us now continued through the first third of the course in fantastic conditions. The organisers had impressed on us at the race briefing the need to watch for oncoming vehicles, but so far the only traffic were sheep and the odd mountain goat. The scenery was awesome as the stony mountains massed around us. The sun was shining, there was little wind and the pace seemed pretty relaxed. In fact, I felt it might have been a little too relaxed, and was wondering if a following group were about to reel us in. I tried to move us forward a bit quicker but not many of the bunch seemed interested in leading (apart from a young Village Cyclist – I felt he would be one to watch). I felt good but also had to remind myself that this was a long ride, much longer than I’d ever raced before. We crossed more fords although none were particularly treacherous, and the road started to roughen up a bit. Patches of loose metal were becoming more frequent, demanding concentration to prevent the front wheel washing out. I forced another Leppin down and a bite of my peanutbutter caramel Powerbar. About 90 minutes in, I wondered how far we had travelled and regretted not bringing an odometer on a desolate ride I had never done before. Observing the other riders didn’t tell me much. Being new to the region I didn’t recognise any of them, and none appeared to be struggling particularly. I was wondering how far we were from the ascent to Island Saddle when we crossed a bridge and a substantial climb came upon us. It didn’t seem particularly long so I figured it mustn’t be Island Saddle. The young Village Cycles rider moved ahead of the bunch a few metres but I didn’t take much notice. This type of small move had happened occasionally up to now with the bunch swiftly rejoining. I assumed that as we were still in the first half of the race, there was no way anyone was going to ride solo through to the finish. 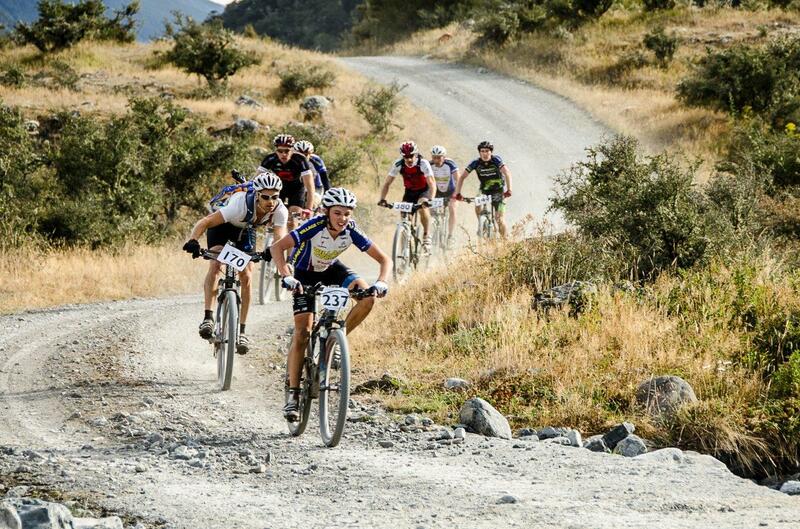 In fact, earlier in the race I had also gained somewhat of an advantage on some of the short rocky downhills. But with so far to go I had just rested for a few seconds while the bunch caught me up. This however was a pivotal moment. Before long, the Young Village Cycles (YVC) rider had opened up a reasonable gap on the bunch, and a second Village Cycles rider had also broken away and was a good 40m ahead. I cursed myself for being so inattentive and started to put in more of an effort. 3 minutes or so later I crested the climb and was appalled to see the two riders quite a few hundred metres ahead on the straight. 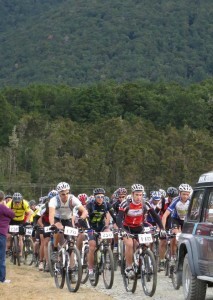 I was now alone with the other 4 riders still contending with the ascent. Bugger, I thought, what to do now? Shall I put in the effort (which I thought might kill me) and try to catch the duo? Or shall I sit back and take it easy while the riders behind me catch up, and then try to work as a bunch to bring the duo back? Not confident that we could work as a bunch, and also with the feeling that the YVC rider was strong enough to hold us off, I decided that it was now or never. I put my head down, dug it in and tried to ignore the increasing wind. After a minute of hard yakker I had a look up and gauged whether I was making inroads. Depressingly it seemed I had got no closer! After another moment of indecision I put my head down and went for it again. This time fortune was with me. After a minute or so, the road hairpinned left and a substantial downhill lead to another river crossing. I had suspected I had an advantage on the downhills and despite the pre-race advice from my wife, threw caution to the wind. Crossing the river I was amazed to see that I had made ground; the VC duo were now only a couple of hundred metres up. Encouragement is a wonderful tonic, and with another leppin and a slurp from the camelback I slowly began easing them in. I was actually a bit surprised that they weren’t going a little faster, and before I knew it I was 20 metres back and eating their dust. Not only that, but the second Village Cycles rider was obviously not going as well as before. It looked like the previous climb might have hurt him a bit, and just a minute later it was myself and the YVC rider leading the race with the second Village Cycles rider going backwards. I was exultant, relieved that (so it seemed) I had made the right call to try to bridge the gap to the duo. Yet I was also a touch concerned. I had been hammering in the last 20 minutes, and was wondering what would happen on the ascent to Island Saddle – which surely must be upon us any minute now. After a winding section the pass narrowed and another substantial climb loomed. This one was definitely the longest so far, and was clearly the climb to the rides highest point, the 1352m Island Saddle. A quick glance back confirmed that the two of us were on our lonesome. And then the climb began, and so did my own private nightmare for the cyclists nemesis had come upon me. I had bonked – there was no climbing strength in my legs. I was helpless as the YVC rider glanced back and effortlessly pulled away from me. There was no point trying to dig it in because there was nothing to dig into – no gas in the tank at all. I changed gears and started spinning, trying to ignore the prospect presented by the next 40-odd kms. I was crawling; at one point I event thought it might be faster to get off and walk. I just concentrated on one corner at a time as a flying pig roadside sign taunted me. Normally I wouldn’t say this was a huge climb, but it certainly seemed that way now. Yet I did crest the summit eventually, and the road took a blessedly downward turn. I could see the YVC rider waaay in the dusty distance and wondered how many other riders I’d see way ahead of me in the distance before the day was out. So began the most horrible stretch of riding I’ve experienced for a very long time. Before the event I had heard that the road could get heavily corrugated although so far it hadn’t been much of an issue. 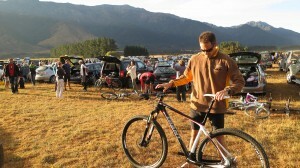 In fact, I was one of the few leading riders on a hardtail and was happy with that – up to now. Because the road really began to cut up. It was like riding with a jackhammer on the base of your spine. I searched in vain for a smoother line but to no avail. I gave standing on the pedals a go but my legs protested against that. The vaseline on my chamois had become entirely useless and my back, which was not great before the race, was pounding like anything. No doubt about it, I was in the Hurt Locker big time. Looking ahead revealed a never ending march of mountains, with the Clarence river stretching into the distance as the road snaked alongside. There were no climbs to speak of – just long straights which revealed no sign of location or distance travelled. Occasionally I looked back, expecting at any moment to be cut down by one of the five riders I felt couldn’t be far behind. But there was nothing apart from the heat, the dust, and now a slight but ominous headwind. I glanced at my watch – 3 hours plus now. How much further I wondered? A peak behind and there he was – the first of the reapers coming to mow me down. I imagined how encouraged he’d be, just as I had been an hour or so earlier whilst on the chase. I tried to put in an extra effort but there was nothing – only the jackhammer. He pulled aside me and then past; one of the VC riders. I tried to draft him but I inexorably fell back. A glance behind from him and then he was gone. The fun continued. Some junctions in the road caused some confusion but I correctly guessed the homeward path. There was a grove of trees ahead which I thought might mean I was getting closer to Jacks Pass (being the final climb before the descent to Hanmer) but like a desert mirage they delivered no relief. The road veered sharply to the left as I hugged the base of some hills. The headwind eased as did the dreaded corrugations. Ten minutes later (although I have no real idea of time surpassed), and another junction appeared. Which way I thought? But then I noticed the red lettered sign saying ‘Hanmer’ and the road start climbing. Never have I been so relieved to see an ascent for it meant the end was nigh. At this point I felt comparatively happy with third, but as I started to spin I surprisingly glimpsed 2nd place in the distance. 5 minutes or so later I crested the hill, and then straight into the screaming final 6km descent to Hanmer. Take care I told myself. I was exhausted, dehydrated (I had finished the last of my 3 & ½ litres about a half hour ago) and the loose gravel demanded attention. Nonetheless I flew down, relieved that I didn’t have to pedal but just tuck in and enjoy the cooling wind. A few minutes later and the gravel became seal with a sharp bend to the left. I felt like I had just exited the Mines of Moria. Another sharp corner and there it was, the black arch across the finish line. Through I went and that was it – the struggle was over. The race was won by the YVC rider (Henry Jaine) in a time of 3:50, with the OVC rider (Brendon Mathews) in 2nd a couple of minutes back. I was 3rd in 3:56. The road surface was proclaimed by the organisers as in the worst condition seen in the Rainbow Rage’s 18 year history. Coupled with a mild headwind towards the end, it was no surprise only three riders broke the 4 hour mark. 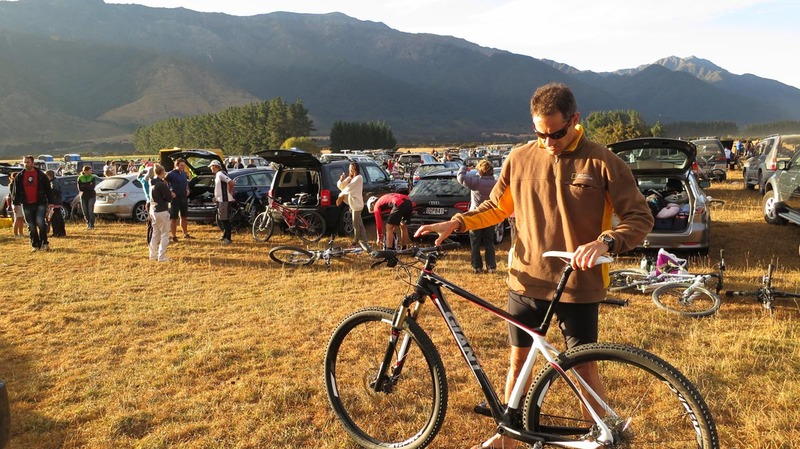 As for me, I was happy to have survived and place relatively well, and also happy at the thought of a post-ride dip at the Hanmer Springs hot pools. Huge thanks to Mike and the organisers, the volunteers, the hard-out competitors, and especially my wife for unlimited support and not getting lost en route.